Quick and Easy Calzones are a delicious alternative to pizza. Warm dough filled with melted cheese and a variety of toppings, everyone can have their individual favorites! Divide bread dough into 5 equally-sized dough balls (they should each be a little smaller than a softball). Spread each dough ball out on a lightly floured surface with a rolling pin as if you were making a pizza (spread it out as much as you can without tearing it). Roll into a 6-7 inch circle. Spread 2 tablespoons of Barilla sauce on the center of each pizza leaving about 1 inch uncovered around the edge for sealing. Remove plastic wrap from each cheese stick and place a cheese stick in the center of each pizza. Put as many toppings as you would like in the middle then sprinkle on a couple of tablespoons of shredded mozzarella cheese. Carefully fold the dough over the toppings and pinch the edges together well so they seal. Make a couple little slits in the top of the dough, spray the top lightly with cooking spray, then bake at 350 degrees for about 25 minutes (or until golden brown). Heat the remaining spaghetti sauce in a small pot or in the microwave and simmer until calzones are done. 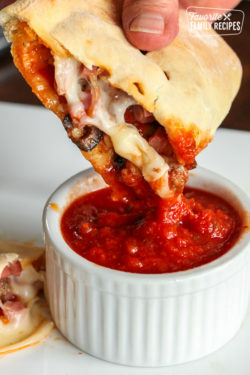 You can serve the calzones with the sauce on the side then dip the calzone into it OR you can pour the sauce over the calzones and top with cheese (thats the way we like it!). For all you meat lovers out there, you can brown some hamburger and add it to the spaghetti sauce to make it extra rich and meaty. *The day before preparing Calzones, set a loaf of frozen bread dough in the refrigerator in a plastic resealable bag and let it thaw overnight. Don't let the dough thaw for over 24 hours.